A mini version of our Viva Chef spring rolls. Can be used as bento box components. Simply pan-fry or deep-fry and enjoy. Product totals 198g (6 rolls, 33g each). 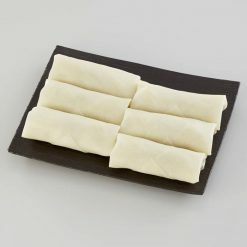 These authentic Chinese-style spring rolls are made with lots of bamboo shoots, pork, wood ear mushroom, and dried shiitake mushroom, and encased in crispy wrappers. 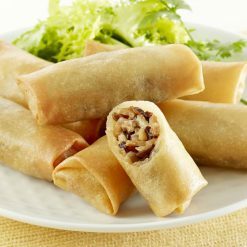 To pan-fry on the stovetop: Place the spring rolls (still frozen) in a frying pan that has had a generous amount of oil applied to it. Pan-fry one side of the rolls for about 4 minutes on low heat until that side turns golden brown, then flip them over. Pan-fry the second side for about 4 minutes in the same manner, until it too turns golden brown.To deep-fry: Place the spring rolls in oil that has been heated to about 170℃ and fry for about 4 minutes.